After the near disaster of Hurricane Sandy the previous year I was anxiously watching the weather reports this year but, although Halloween night itself was a bit damp, it really didn't deter anyone and we had near record numbers over the 2 nights we were open. We again had a pre-Halloween Open House for family and friends which was a big success. It was great to be able to share with a number of my haunter friends who are normally too busy with their own haunts to see any others. There wasn't any wind that night and the fog machine was kicking it into overdrive - it literally fogged the whole street! Sadly the wind returned Halloween night so it wan't nearly as effective but still added tons of ambience. The Flying Crank Ghost in the upstairs window was a big hit with everyone. She sometimes wasn't noticeable at first but as soon as people saw her there was lots of gasps and pointing! The expanded witch's porch continues to be the most fun to put together. 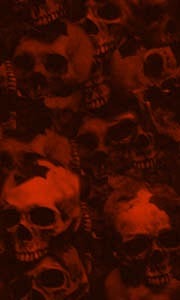 Since I don't do a walk-through haunt this is my one opportunity to create a complete room environment. Plans are already being laid for next year! Exactly how many cornstalks and hay bales can one fit inside a small hatchback car you ask? The answer this year was 8 dozen or 96 cornstalks and 2 hay-bales while still being able to drive home. Good thing it wasn't far. This year I was so pleased and honoured to have photographer Carl Chalupa of Room 57 Photography come out to photograph the display. I've been taking my own photos from the start and have been happy with them but after a few years you tend to take the same photos again and again. It's great to get someone with a fresh perspective and can make you see your haunt in a brand new light. Carl is an amazing photographer - he'll be the first to tell you he's not a professional but don't you believe him! He's well known among the Ontario Haunters community and has shot many of the best haunts around. He came out to Brampton on the night of the open house - October 30. Not everything was entirely set up but it's incredible the shots he was able to get! It really was like seeing my haunt for the very first time. Thanks so much Carl!! Here is the video I put together to showcase the haunt this year. Although was some distortion and glitches in the footage I shot I was very happy with how it turned out. All of it was shot handheld with a Sony Cybershot RX100. It was so windy though I couldn't use any of the actual audio and had to put it in during post-production. 2013 an Award Winning Year! This has been a stellar year for my Blackstone Cemetery Haunt in no small part to having the pleasure to be recognized in a number of contests. My haunt doesn't change all that much from year to year so I don't enter contests all that often but this year I participated in a number of online contests I hadn't had to opportunity to do so before. First up was that I entered my haunt video in the Home Haunt Contest for 2013. This was their first year running the contest and it was done a bit differently than most Facebook type contests which are little more than an online popularity contest. Here you entered your haunt into one of three levels - Level 1 for beginners or kid-friendly haunts, Level 2 for more elaborate yard haunts and Level 3 for the most over-the-top with full haunted walkthroughs (I entered into Level 2) and then gathered ratings from the public to make it into the top 13 which would then be judged by a panel of experts. I was VERY excited to see all the ratings come in and make it to the top 13 to be judged. It was a real nail-biter but and very close to call but in the end I was selected as the FIRST PLACE LEVEL 2 HAUNT for ALL of North America!! Actually, International since I think there were a few haunts from overseas entered! This was truly an honour as I was up against some tremendous haunts, many of whom I've looked up to for years. Also very glad to see that my friends Brad Goodspeed and Chris Ainsworth took home 1st and 3rd place awards in the Level 3 category for their Butcher of Provincetown and Thornhill Woods Haunted House! Way to go guys! 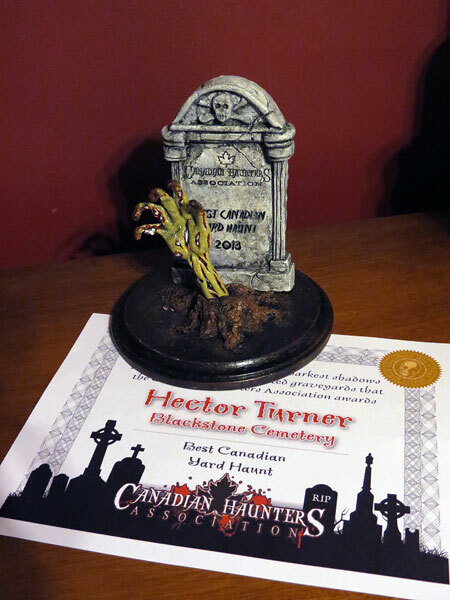 Next, I was very, very pleased and truly honoured to have my video win for BEST YARD HAUNT in the Canadian Haunters Association's annual Home Haunt Awards. This is the 2nd year in a row the CHA has presented these awards and already they are gaining recognition in no small part due to the incredible trophies! Thanks to all the judges, the CHA for organizing the awards and Haunted House Creations for creating the amazing trophies!! It will occupy a place of honour for many years to come! Following tradition next year I will be one of the Judges and anticipate a hard job coming up with the winners from such a great variety of haunts Canada has to offer. Lastly, I was very surprised and overjoyed to be presented with the BEST VIDEO PRODUCTION from the Dead With Dave 2013 Home Haunt Awards!! Considering I don't always make an effort to create a Haunt video every year this award was especially rewarding. Thanks to David Dankanyin from Pandemic Haunt Production for doing such an amazing job on the awards show - far more entertaining than most Hollywood awards shows by far! Thanks also to all the judges and congrats to all the other winners, nominees and everyone that entered! Such an incredible display of talent and creativity!! Special congrats as well (again!) to my fellow Canadian haunters Brad Goodspeed and Chris Ainsworth for their well-deserved wins for 'Best Veteran Haunt' and 'Best Home Haunt' respectively! I'm so lucky to live close enough to these world-class haunts to see them in person. The haunt was up and running for 2 nights this year - I had a pre-Halloween open house the night before for friends and family to come by and check it out. The display wasn't entirely finished but it was mostly done and more than presentable. The big thing was trying to run around and get the lights set-up. The night was a big hit with lots of visitors - even some friends and teachers from my daughter's school came by which she loved! Halloween night itself wasn't so nice - a bit of rain and colder with the wind picking up quite a bit. It didn't matter to the kids though - between the two nights we had a near record turn-out. We had many repeat visitors from previous years who would comment on how much they looked forward to it every year which was really nice. The kids missed the giant spider as I didn't put him out on Halloween night (it's such a pain to dry off I opted to keep him packed away) and many commented on the fact I wasn't in costume scaring folks. I was so busy up until show-time I didn't bother with a costume. It was nice to be able to chat and visit with people but I'll definitely have to change that next year and bring back the scare! All in all, I think it was our best year yet!! Once again the most popular question of the evening continues to be "Where do you store it all?" :) This year I was able to pack even more than usual away into the storage room under the front porch which has officially been designated for "Halloween Stuff". I even took a series of photos as I filled it up and just for fun have assembled them into the animated gif below! See, it's like magic!